Zarah has named the "SLIA Essay Writing Contest Winner." Congratulations to Jayson Balaqui! "I can’t change Filipino librarians, but I can change the way you look at us." This is one great quote that I have read most especially when I was browsing the internet and landed into the blog site of Mr. Vernon Totanes of the filipinolibrarian.blogspot.com last January. In case you ever wondered what happened to my post quoting the doctor who said, "When you are a doctor you cannot be a librarian," the doctor concerned left a comment on my post that you may want to read. I truly apologize for the error in the statement attributed to me in a recent article written by Ceres Doyo after interviewing me in the hospital – "When you are a doctor you cannot be a librarian." That was my unfortunate choice of words, not hers. The sentence should have been phrased: "When you are a doctor, you should not be solely 'book-oriented' by trying to make the patient fit patterns and standard guidelines in medical textbooks and manuals – instead, you should be learning from each individual patient." Unfortunately, I have observed that many medical students and doctors, including some of my own students, memorize diagnostic groups and treatment algorithms, and often miss the unique characteristics of each patient. This is aggravated by the structure of many medical tests and board exams. In some instances, the lack of recognition of each patient’s uniqueness leads to serious, sometimes fatal, consequences. That was the issue in the lawsuit I filed as a lawyer described in the article by Ceres. The comment was certainly not meant as an insult to any librarian or to the profession of library science in any way. Again, my apologies. A copy of this letter was also forwarded to the author of that article. I appreciate the time Dr. Bernal took to leave the comment on my post, but I think we also need to address an issue raised by one of those who left an earlier comment on that post: "'what have we done as an individual/profession' to educate the outside world about the wonders of being in this profession?" As I keep saying over and over again, "No one is obliged to recognize the importance of librarians—we must be the ones to convince others of the importance of the work we do. We need to be more proactive about communicating and interacting with our own communities, and networking—and working—with other literacy and library advocates." The links below lead to the sites that I will be discussing at the Congress of Southeast Asian Librarians today, April 22, 1:55 pm. 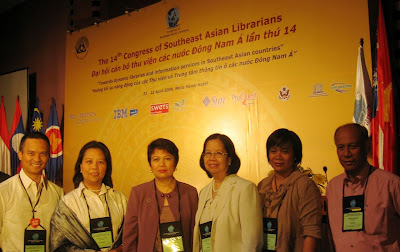 The 14th General Conference of the Congress of Southeast Asian Librarians began today. The photo above shows some of the Filipino librarians who arrived yesterday. The photo below shows the six Filipino librarians who will be among those speaking at the two-day conference's forty sessions. From left: Me, Elvie Lapuz, Beth Peralejo, Mila Ramos, Fraulein Oclarit and Nehmi Pasamba. Pasamba, incidentally, is attending the conference as a Filipino librarian working in Thailand. The most striking session so far was the one by Dr. Varaprasad, who shared Singapore's successful leveraging of volunteers at its National Library. I just learned about Blog Reader Appreciation Day via KyusiReader. The objective is to "thank and celebrate readers with special tributes, posts, contests, and give-aways." I don't really have time to think of the mechanics for a contest, so let's just say that the first five commenters (make sure you input your correct email address in the proper box) will get a book from me. I'll figure out what book to give you based on what you say in your comment—fiction or nonfiction? library-related or not? heavy or light reading? You may also wish to leave a comment regarding what you like or don't like about this blog. Good or bad, feedback is always good (for me, anyway), so don't be afraid to write what you think. If your comment is really fantastic, I may just decide to give you a special prize. You can also email me at vondottotanesatgmaildotcom if you don't want other people to see your comment. No promises on when I can give you the book, but I'll get them to you as soon as I can. By the first week of May if you're in Metro Manila, before the end of May if you're elsewhere in the Philippines or Southeast Asia, July if you're in North America, and August if you're somewhere else around the world. And thank YOU for reading my blog. This is one contest librarians should join. The contest started a few weeks ago, but even though it's sponsored by Philippine Daily Inquirer and National Book Store, it's not available on either sponsor's website. 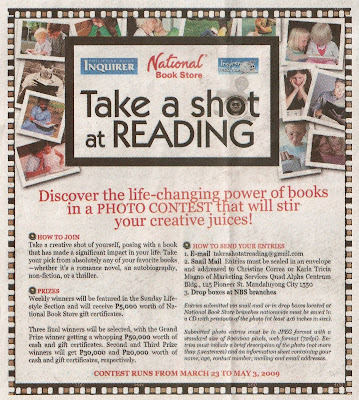 So I scanned the ad from the newspaper (Philippine Daily Inquirer, 9 April 2009, p. C3) and have reproduced the text below. Please note that the contest ends on 3 May 2009. Discover the life-changing power of books in a PHOTO CONTEST that will stir your creative juices! Take a creative shot of yourself, posing with a book that has made a significant impact in your life. Take your pick from absolutely any of your favorite books – whether it’s a romance novel, an autobiography, non-fiction, or a thriller. Weekly winners will be featured in the Sunday Lifestyle Section and will receive P5,000 worth of National Book Store gift certificates. Three final winners will be selected, with the Grand Prize winner getting a whopping P50,000 worth of cash and gift certificates. Second and Third Prize winners will get P30,000 and P20,000 worth of cash and gift certificates, respectively. Entries submitted via snail mail or in drop boxes located at National Book Store branches nationwide must be saved in a CD with printouts of the photo (at least 4x6 inches in size). Submitted photo entries must be in JPEG format with a standard size of 800×600 pixels, web format (72dpi). Entries must include a brief description of the photo (not more than 5 sentences) and an information sheet containing your name, age, contact number, mailing and email addresses. CONTEST RUNS FROM MARCH 23 TO MAY 3, 2009. In 1908-1909, the first systematic environmental surveys of the Philippines were made upon direct orders from President Teddy Roosevelt... American botanists inventoried our plant diversity. The records of their works are in the Philippine Journal of Science. Unfortunately you will have to travel to the USA to get access to a complete set of the tomes. I haven’t found a library in the Philippines with a complete set. Blame the Japanese for setting on fire the libraries in 1945. The quote above, from "Beyond 'Earth Hour': Some new things I’ve learned," reminded me that I've been meaning to feature—again—The United States and its Territories: 1870-1925: The Age of Imperialism (USIT), which includes in its collection all the volumes of Philippine Journal of Science (PJS), from the first one ever published in 1906 to 1949. 1. A search on USIT for "philippine journal of science" as title will lead to a list that does not recognize the volume numbers as such. For instance, volume 1 is followed by volume 10, 11, 12, etc. ; 2 by 20, 21, 22, etc. ; 3 by 30, 31, 32, etc. 3. Not all the links will lead to actual issues. In some cases, these go to supplements, and one in particular takes the reader to a separate index for the years 1916-1925.